Great balance and integration of fruit and oak on the palate with the aromas of violets and mint mixed with layers of berries. Beautifully sparks in a ruby red colour in the glass with some harmony between tannins, fruit and oak notes with fine acidity with a lingering finish. The grapes were handpicked yielding 6 tons per hectare. They were then crushed, destalked and pumped into a combination of stainless steel and open fermenters. A controlled fermentation was ensured and regular pump-overs and punch-downs were done. The wine was matured in 500-liter French oak barrels (30% new oak) for 18 months. Muratie's rich history is captured in every nook and cranny. Wherever you are on the estate you cannot help being moved by a sense of the many generations that have lived and worked there. The buildings, the artifacts and even the shrubs and trees exude an aura of the colourful past reaching towards an even more fruitful future. 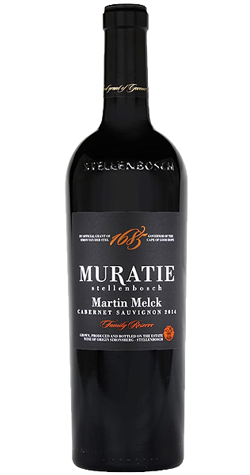 Standing in front of the cellar door at Muratie, you will see a small white building, this was the first home that Lourens Campher built for his family. Beside the house is the oak tree his wife, Ansela van de Caab, planted. The strength and beauty of the tree is testament to the steadfast love Lourens had for his Ansela.